Mercedes Vazquez Simmons is the President of Pretty Girl Productions LLC, New York’s first licensed Latino female boxing promoter and the first Puerto Rican female boxing and Mixed Martial Arts (MMA) promoter in the United States. Mercedes holds a masters degree in Business Administration. In 2000 she took a position with Rock Solid, a boxing management company based out of New York City where she worked with Spanish-speaking fighters. Rock Solid represented World Champions William Joppy, Hasim Rahman, and Oscar De La Hoya, just to name a few. In her company role, Mercedes learned all aspects of the business from boxing management to project managing boxing shows. In 2012, Mercedes left her job with Rock Solid and started Pretty Girl Promotions, a full-service Boxing & Mixed Martial Arts promotion company. She had the privilege of working with world-class champions fighters Lee Murtagh, Hector Camacho, Patrick Hyland, Melissa Hernandez, and up and coming fighters like Lavisas Williams. After a short few years, Pretty Girl Promotions is considered now a World Class Promotion company, as fighters signed under her promotional company secured a World title. In addition to adding world championship titles under the promotional umbrella, Mercedes has embarked on several projects including a co-promotion with the first lady of boxing Christy Martin that will be featured on CBS’s 60 Minutes. Mercedes Vazquez-Simmons and Pretty Girl Promotions have represented Rochester well and have been quoted in major publication and media outlets like ESPN Sports and Fight News. Through her company, Mercedes has contributed to the local economy by bringing World Class boxing events to Western NY. She hires local resources and services with estimated economic benefits exceed $100,000 per year. She’s also provided employment opportunity to those who may have difficulties finding employment such as the individuals that were released from the prison systems, veterans, and retired athletes. Despite the challenges of being a female & Latina promoter in a male-dominated industry, Mercedes has made her mark. She has received several community-based awards and national accolades recognizing her work. Mercedes comes from humble beginnings. Her parents moved from Puerto Rico in the 60’s looking for a better future. Her father took on migrant work and eventually landed a job at Kodak, her mother worked as a paraprofessional at the Rochester City School District. Her father and brothers would spend weekends watching big boxing matches such as Hector Camacho and Muhammad Ali, and both she and her brothers often imitated the fighters. Mercedes is very involved in the community, personally participating or sponsoring grassroots events through her company Pretty Girl Productions. She regularly is asked to speak at local and national organizations (including Latinas Unidas Cafe con Leche, Annual Father’s Day Rally- against domestic Violence, Puerto Rican Parade and the Puerto Rican Festival). She gives motivational talks about her career and the challenges she has experienced and has organizing boxing demonstrations for schools that include the importance of self-discipline. Mercedes has worked endlessly to help improve the lives of fighters. 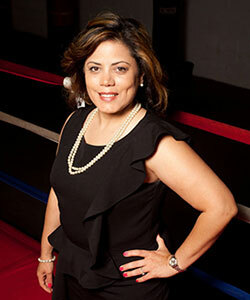 She honed-in on health and career development for boxers in Rochester, NY and surrounding towns. She developed the first Professional Career Development & Ring safety curriculum. The program educated fighters of health warning signs, running their professional career as a business, personal finance and banking (many fighters have never opened a bank account), it included a path to completing their GED for those who didn’t have it, learning about domestic violence, and it has provided resources to medical insurance and assisting with employment opportunities outside the boxing industry. The program is being proposed to other state commissions and boxing associations. For several years Mercedes also actively advocated for the legalization of Mixed Martial Arts (MMA) in the State of New York. More recently Mercedes started a non-for-profit boxing program called Center City Boxing for kids ages 5 to 18. The workshops are focused on teaching self-discipline, self-control, and self-respect.